Maastricht University helps Universidade Católica de Moçambique (UCM) in Beira: donate and help us to raise money. From university to university. Together we can ensure that education in Mozambique can continue. If a cyclone destroys everything, you put your shoulders together. IBAN: NL21 INGB 0653 6632 42 under the name Stichting Universiteitsfonds Limburg/SWOL referring to Care for Beira, Maastricht University. A humanitarian disaster happened in Mozambique. Thursday evening, 14 March 2019, cyclone Idai came ashore in the port city of Beira, Mozambique. The tropical storm raged over the country for two days. Heavy rainfall and strong winds leave a great devastation. Beira in particular was hit hard. 90% of the city is damaged or destroyed. Around 483,000 people lost their homes as a result of the disaster also in neighbouring countries Zimbabwe and Malawi. 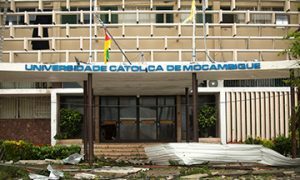 The Universidade Católica de Moçambique (UCM) in Beira, a collaboration partner of the School of Health Professions Education of Maastricht University, has been hit hard and can no longer function. Since 30 years, UM (SHE Collaborates and MUNDO) has been working together on projects related to the development of the health and medical faculty of the university in Beira, and is working together on faculty development, curriculum revision, staff training, educational innovations and more generally on health promotion in Mozambique. “This is the biggest disaster in Mozambique’s recent history,” says SHE Collaborates Director Geraldine Beaujean who was present during the cyclone for a project at UCM. She has endured the cyclone and has seen the devastation it has left behind. The affected university urgently needs literally new shelter and building materials to rebuild the university and resume the education. The water is meters high in various places. Entire buildings have been swept away or flooded, there is no electricity, the hospital is no longer usable and a temporary emergency hospital has been set up with difficulty on the ground floor of the university. The health faculty and the hospital have been destroyed. It is impossible to offer education to students and to doctors in training and the first priority is reconstruction. You can help. This campaign from Maastricht University aims to help the Universidade Católica de Moçambique with financial resources and a positive impact so that the students can resume their education quickly and to restart the project cooperation with UCM from 1 January 2020.